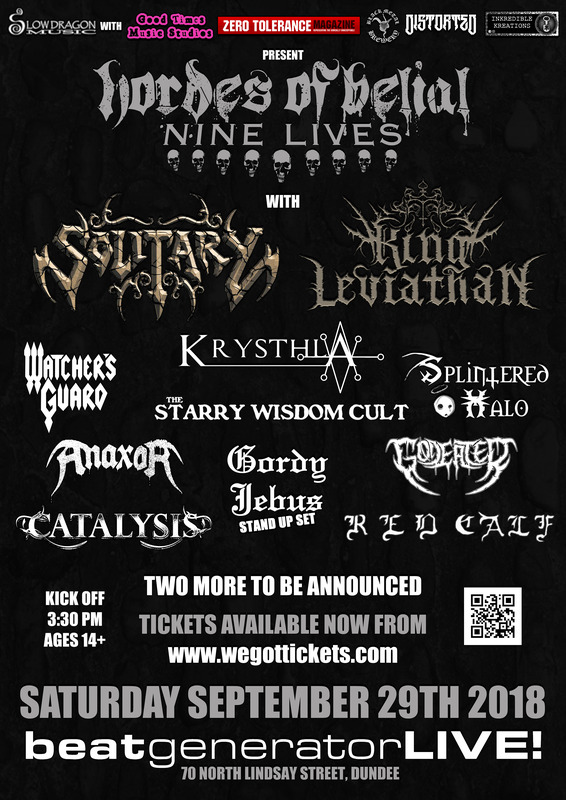 With four more bands being revealed here, the line-up for this year’s Hordes Of Belial is almost complete! We’ve taken some chances here, mixing well-loved returning artists with high protein fresh meat. As always, our aim is to dig gems out from the dirt of the underground, and we believe we’ve managed that extremely well. First of all, we’ve added a band we will never tire of hearing, The Starry Wisdom Cult. They might not be the heaviest to grace the Hordes stage over the years, but they sure know how to lay down a riff, and possess musical character in abundance. Also joining us will be the old school style of Anaxor. Featuring members (current and past) of Dog Tired, Firebrand Super Rock, Man Of The Hour, and The Exploited, this Edinburgh based project offers up classic riffs in spades. Dundee’s Catalysis will be providing a local interest, featuring some of the city’s best known metal musicians. Their new formation cranks the heaviness up a notch, adding lead vocals to the duties of bassist Colin MacGregor. Finally, we have added our second stage opener, Red Calf. Being a young two piece, they unfortunately don’t have any material released as yet, but it is in the works. Expect extreme, technical metal. That leaves us with just two bands to announce to complete the line-up, and they are both gonna be crushing! Get your tickets now from www.wegottickets.com. Posted in Latest News and tagged Anaxor, Beat Generator Live, Black Metal Brewery, Catalysis, Distorted, Godeater, Good Times Music Studios, Gordy Jebus, Hordes Of Belial, Inkredible Kreations, King Leviathan, Krysthla, Nine Lives, Red Calf, Slow Dragon Music, Solitary, Splintered Halo, The Starry Wisdom Cult, Watchers Guard, Zero Tolerance.